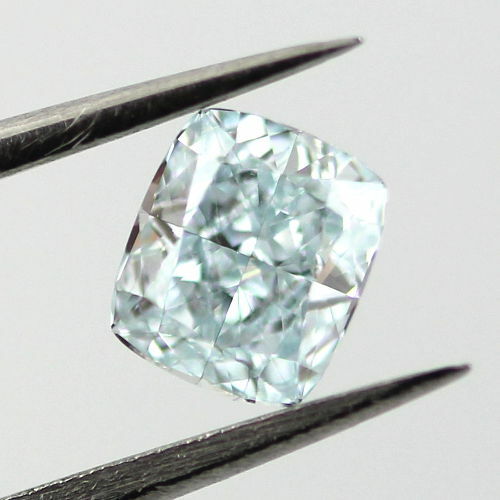 The Fancy Green Blue Diamond, Cushion Cut, really is a one in a million gemstone. This diamond is a true beauty. It weighs 0.50 carat, with absolutely excellent clarity grade of vs1. It has no fluorescence and its polish is excellent and unsurprisingly, it also has very good symmetry. Its dimensions are 4.92x4.25x2.75, which is quite a sizeable rock to give to anyone as a gift. Although with such a color, it is easily considered to be a collectors diamond. After all, it will look just as beautiful on a ring as on its own presentation cushion.